The special focus this week is on the advance of Maoist rebellion in India, which takes us beyond our usual focus on Iraq and Afghanistan. Then we look at the decline of the American empire. In addition, some of our “usual” sections: Afghanistan and Wikileaks. See also the newest information under Public Anthropology Notes. While many of us have focused on the U.S. “war on terror,” the Iraq and Afghanistan invasions and occupations, the institutionalized Western dread of the Taleban and Al Qaeda, and the acts of U.S. empire, the fact remains that other wars, no less brutal, have been advancing and gaining less notice, and other empires, no less imperial for being inward reaching, continue to fortify themselves. In particular, we are speaking here of the war against the advance of Maoism primarily in India, and the paths of the Indian state which are no less shocking than anything we might read from Wikileaks about Iraq or Afghanistan. “The Trickledown Revolution,” Arundhati Roy’s extended piece, is a striking and compelling article, possibly one of the best articles I have read online in a long time. Many themes of fundamental concern to political anthropologists appear in this article: from the maintenance of a colonial legal legacy, to the fighting of counterinsurgency at home (in this case called “sub-conventional warfare” by the Indian state), to the existence of empire within, to a description of India’s “shadow people,” the “shadow war,” and the context of elite-controlled developmentalism and the calculated expropriation of resources of tribal areas, ostensibly protected by the Indian Constitution itself, to a description of institutionalized Left parties and their internecine, Eurocentric battles, to various strategies of resistance, and finally the Maoist Naxalite rebellion. We are first taken to Jantar Mantar, which seems to have become something akin to a protesters’ ghetto, a space on the margins where public protest is permitted. But even that has changed since India decided to host a celebration of British empire, the Commonwealth Games in 2010. Now the protesters are cleared out by 6:00pm, joining the dispersal of the hundreds of thousands of residents and vendors also forcibly pushed out of the city almost overnight, to make way for the international games and for private interests. Developmentalism—showing that the development of some comes at the expense of the underdevelopment of others, is a persistent theme of the article. As Roy shows, this is an India that with the second-highest economic growth rate in the world, has more poor people than 26 of Africa’s poorest countries put together. India’s per capita food grain availability has decreased over the last 20 years—during what happens to be the period of its most rapid economic growth. The 100 richest people hold assets worth a full 25% of India’s GDP. Manmohan Singh, India’s Prime Minister, who has pushed through the economic transformations that have vastly inflated the wealth of the richest, and the poverty of the poorest, was literally hand picked by the IMF as its choice of Finance Minister for India, one of the preconditions for a lending program to the country. Meanwhile, Sonia Gandhi and her son Rahul, continue the overt public pretense of care and compassion for the poor, helping Singh to win elections and continue the privatization of everything. Having plundered the country, local elites use money that is effectively stolen from those they have impoverished, and as Roy says, ask why it is then that the Maoists do not stand for elections. And we also learn of the sheer brutality of the state in repressing those who organize to challenge glaring inequalities, the enforced misery, the concerted effort of the state to maul the poor. Roy locates the Maoist rebellion within a long-term history of numerous tribal uprisings against the British colonial regime and the post-independence state. 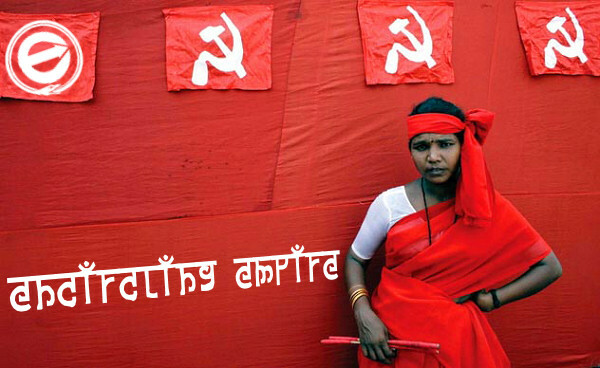 As she explains, “tribal people were at the heart of the first uprising that could be described as Maoist, in Naxalbari village in West Bengal (where the word Naxalite—now used interchangeably with ‘Maoist’—originates).” Naxalite tribal politics and Maoist rebellion are now deeply intertwined. The Maoists themselves have emerged from a series of successive rebellions under different “avatars” as Roy says, each time said to have been exterminated and utterly defeated, and each time resurging stronger than before, over a wider area. Here we see the continuation of colonialism through “independent” means, a transition to neo-colonialism, and domestically, internal colonialism. As Roy relates, “The Indian Constitution, the moral underpinning of Indian democracy, was adopted by Parliament in 1950. It was a tragic day for tribal people. The Constitution ratified colonial policy and made the State custodian of tribal homelands. Overnight, it turned the entire tribal population into squatters on their own land. It denied them their traditional rights to forest produce, it criminalised a whole way of life. In exchange for the right to vote, it snatched away their right to livelihood and dignity.” Then in comes “development” and “modernization” –state campaigns to fix “the problem” of the tribes, a problem that the state engineered and which it now proclaims to “solve” through even greater intervention. To follow more news see the Indian Vanguard blog. See also Gautam Navlakha: Days and Nights in the Heartland of Rebellion. It seems that most Americans want taxes increased for the rich, more than 60%, with the second-largest group (20%) wanting to see cuts in military spending. See: “Most Americans say tax rich to balance budget: poll.” Which part of the world do most Americans see as the most troublesome? Washington D.C. Finally, it seems more Americans are coming around to a way of thinking that we share. “To one degree or another, we have been on the Soviet path for years and yet, ever more desperately, we continue to plan more surges. Our military, like the Soviet one, has not lost a battle and has occupied whatever ground it chose to take. Yet, in the process, it has won less than nothing at all. Our country, still far more wealthy than the Soviet Union ever was, has nonetheless entered its Soviet phase. At home, in the increasing emphasis on surveillance of every sort, there is even a hint of what made “soviet” and “totalitarian” synonymous. “The U.S. economy looks increasingly sclerotic; moneys for an aging and rotting infrastructure are long gone; state and city governments are laying off teachers, police, even firefighters; Americans are unemployed in near record numbers; global oil prices (for a country that has in no way begun to wean itself from its dependence on foreign oil) are ominously on the rise; and yet taxpayer money continues to pour into the military and into our foreign wars. It has recently been estimated, for instance, that after spending $11.6 billion in 2011 on the training, supply, and support of the Afghan army and police, the U.S. will continue to spend an average of $6.2 billion a year at least through 2015 (and undoubtedly into an unknown future) — and that’s but one expense in the estimated $120 billion to $160 billion a year being spent at present on the Afghan War, what can only be described as part of America’s war stimulus package abroad. “Should we rejoice or not in America’s decline?” –The CBC’s Richard Handler worries: what comes after American dominance? “Careful what you wish for” is the thrust of his piece, which at least is ahead of most articles in the Canadian press in that it actually posits “America’s decline” as something that is actual and factual, requiring that we think about the future. On the other hand, the article is useful for revealing bundled assumptions that would cause someone to view the future with such trepidation. Handler seems to equate a good world order with a stable one, where stability means normalcy and normalcy means continuity. Perhaps if he were more on the losing end of the world-system, with a long suppressed social agenda constantly defended against extinction, he would have something to look forward to, possibly. The surge is working—but not necessarily the way the Americans intended, assuming that opinion polls conducted in a war zone are ever anything to take seriously. It seems that more Afghans are supporting Taleban attacks, seeing them as justified, a number that has risen by 8%. In addition, only a minority, 36%, expressed any confidence that the U.S. and NATO would bring “stability.” An overwhelming majority, 73%, want to see negotiations take place with the Taleban. As “Cablegate” seems to have dried up considerably—with the “media consortium” barely able to release as much as a single cable in the past three days—the stories based on the few cables released have constantly been overshadowed and upstaged by the saga of Julian Assange. We have been faced with stories of his temperament, his sexual habits, reports from his female accusers, and then an arguably inappropriate if not bizarre display of his Christmas celebrations. At the same time, the one we might call the real hero behind the leaks may be the one who is currently in solitary confinement, possibly having sacrificed the rest of his life for the sake of our knowledge. Yet Assange claims that he “owns the leaks,” and asserts his “financial interest” in them. One has to wonder then if John Young at Cryptome has it right in his article, “Wikileaks Rest in Peace,” just as we learn from an extensive piece in Vanity Fair: “Through December, WikiLeaks still wasn’t collecting new documents from potential whistle-blowers. The site is crowded with pleas for donations. ‘He is short of money and short of secrets,’ someone who has worked extensively with Assange told me. ‘The whole thing has collapsed’.” Meanwhile, we also learn from the Wall Street Journal, that Assange has assigned himself a salary of €66,000 per year, out of a total of €100,000 paid for salaries in total, the remainder shared among a handful of full-time staff. Likely of greatest concern to Wikileaks is that while it managed to raise €765,000 before August of 2010, since then donations have dropped off considerably, raising only €235,000 since August. Considerably more positive articles and reports will include CBS’ “How WikiLeaks Enlightened Us in 2010.” This is an extensive—but by no means exhaustive—highly readable and well organized overview of the most significant news generated from Wikileaks’ multiple releases throughout last year, with global coverage, and a profusion of links to relevant stories. “Cynics will argue that none of what we have learned from WikiLeaks differs from the usual way in which high-level international politics is conducted, and that without diplomatic secrets, the world would be even less manageable and more dangerous for everyone. Political classes on both sides of the Atlantic convey a simple message that is tailored to their advantage: trust us, don’t try to reveal our secrets; in exchange, we offer you security. “But just how much security do they really offer in exchange for this moral blackmail? Little or none, since we face the sad paradox that this is the same political elite that was incapable of properly supervising the international financial system, whose implosion triggered the biggest crisis since 1929, ruining entire countries and condemning millions of workers to unemployment and poverty. These are the same people responsible for the deteriorating quality of life of their populations, the uncertain future of the euro, the lack of a viable European project and the global governance crisis that has gripped the world in recent years, and which elites in Washington and Brussels are not oblivious to. I doubt that keeping embassy secrets under wraps is any kind of guarantee of better diplomacy or that such an approach offers us better answers to the problems we face. “The incompetence of Western governments, and their inability to deal with the economic crisis, climate change, corruption, or the illegal war in Iraq and other countries has been eloquently exposed in recent years. Now, thanks to WikiLeaks, we also know that our leaders are all too aware of their shameful fallibility, and that it is only thanks to the inertia of the machinery of power that they have been able to fulfill their democratic responsibility and answer to the electorate. Thanks to Daniel Lande at Neuroanthropology for producing this very useful roundup, “Anthropology and Publicity,” with extracts and links to the excellent essays produced for a blog/event we reported on earlier, Anthropology and/in Publicity. They are differently worth circulating and saving in any compendium of public anthropology papers.